Two years ago, Amy Tan put out an ebook called Rules for Virgins. It was only available as an ebook, but at just 43 pages, it was intriguing. It served as a guide for courtesans, one in particular, on becoming successful and being named one of Shanghai's Top Ten Beauties. At the time, I commented that I would love to see a novel based on the short. I didn't realize she was setting the ground work for The Valley of Amazement. The book opens in 1905 Shanghai with seven year old Violet living at Hidden Jade Path, a first-class courtesan house owned by her mother, Lulu Mintern, the only white woman to own such a house in Shanghai. Courtesans differ from prostitutes in that they don't work the streets and they don't offer their services cheaply. They're more like mistresses for wealthy men, most of whom are in business-like or arranged marriages. These women are courted and wooed by wealthy men and enter into contractual relationships with them for periods of time. Up until the age of 14, Violet is a witness to the goings on of Hidden Jade Path. Lulu, or Lucia, Mintern is a difficult woman to understand when we initially meet her. She dazzles the men that visit her establishment, never forgetting a name, making connections between her guests as she sees fit. However, she's reserved and distant when it comes to Violet. Her daughter seeks her attention and, much like Lulu's parents did her, she continues to brush off her child, a decision she will come to regret. Tan's story is cyclical in nature. We see Lulu's strained relationship with her parents in which she feels ignored and acts out as a result. In turn, she becomes a parent much like her parents and ignores her child. We also see Lulu use her haughtiness and sense of entitlement to force her way into a forbidden relationship. This is repeated later by Violet and neither woman ends up with the outcome that she'd predicted. It's interesting to see how Violet goes from a daughter of privilege to a courtesan. In the same way that her mother has Golden Dove to act as her mentor and partner, Violet forms a partnership with Magic Gourd, history repeating itself once again. I have to wonder if Violet's daughter, Flora, would have found herself in the same cycles. I'm used to stories going back and forth between characters and locations, but it was strange that Tan waited until she was 400+ pages before she introduced Lulu's history. When we meet her, she's an adult with a child, but we don't know how this white woman came to be living in Shanghai. By the time she tells us, we're so invested in Violet's story that it's almost irrelevant. It's just my opinion, but I would have preferred to know Lulu's background much earlier than it was introduced. This book started off slow for me. At 60 pages in, I began to wonder if I should finish it. 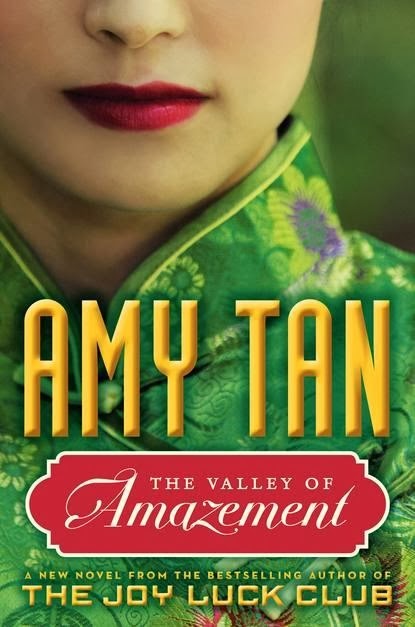 But this is Amy Tan. I knew if I stuck with it, it would pay off in the end. Indeed it did.